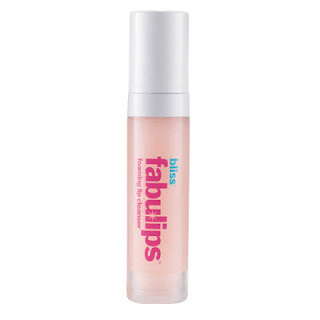 Regular readers may recall that I've previously reviewed a couple of products from the Bliss Fabulips range, namely the Fabulips Lip Scrub and Lip Balm and today's review follows in the same vein with a review of the Fabulips Foaming Lip Cleanser. As with all Bliss products, I liked the bold packaging. It's functional too, with a pump dispenser which releases just the right amount of product so that there's no wastage. What's more, I liked that the tube is transparent so that you can see how much product is remaining. The only downside is that I felt it was lacking in clear directions for use. I tested this out when wearing Topshop Rio Rio lipstick, a bold orange-red which is fairly long-wearing. I applied a single pump's worth to my lips which was the perfect amount. I imagine that the tube will last a long time. The cleanser itself is a pearlescent gel formula which has the same tempting sweet orange fragrance as the other products I've tried from the Fabulips range. Upon application, the cleanser starts to foam (there's no need to apply to damp lips or mix with water) and it's very reminiscent of Bliss' bestselling triple oxygen mask. I found the foam slightly tickilish but it's by no means unpleasant or uncomfortable. I decided to remove the product using a dampened cotton wool pad to avoid staining any towels or flannels. My bold red lipstick was quickly and easily removed. Overall, I really liked Bliss Fabulips Foaming Lip Cleanser. At £12, it's by no means an essential product as you can, of course, use your regular cleanser or purchase a lip & eye makeup remover in one but if you regularly wear bold lip colours or long-wear formulas, then this is worth checking out. Hello! You gave me your blog link yesterday! I am now following you, you have a great blog! Thank you for the review, but I think that it is not that much necessary!